Truffles are an underground fungi that flourish via a symbiotic relationship with the roots of certain trees, including hazel and oak. They are not mushrooms which are a completely different fungi. They are also not to be confused with the chocolatey stuff that bears the same name. At Macenmist we have three varieties of trees: Hazel, English Robur Oak and French Ilex Oak. The first trees were planted in October 2008 with a second planting in October 2012. All trees have been inoculated with tuber melanosporum which is the botanical name for the Perigord Black Truffle. In 2011 our first truffles were found on trees that were less than three years old. The initial quantity was small but the quality was excellent. Over the subsequent years more trees produced truffles and over the next few years it is expected that this will continue to increase with the second plantation starting to yield fruits. The external appearance of the black winter truffle (tuber melanosporum) can range from a reddish brown to black and its outer surface is called the peridium. The internal tissue with its distinctive white veins is called the gleba. In the kitchens of chefs and cooks our truffles were the focus of their cuisine. Now, and in the future, we are looking forward to supplying you with this humble fungus, the Perigord Black Truffle. 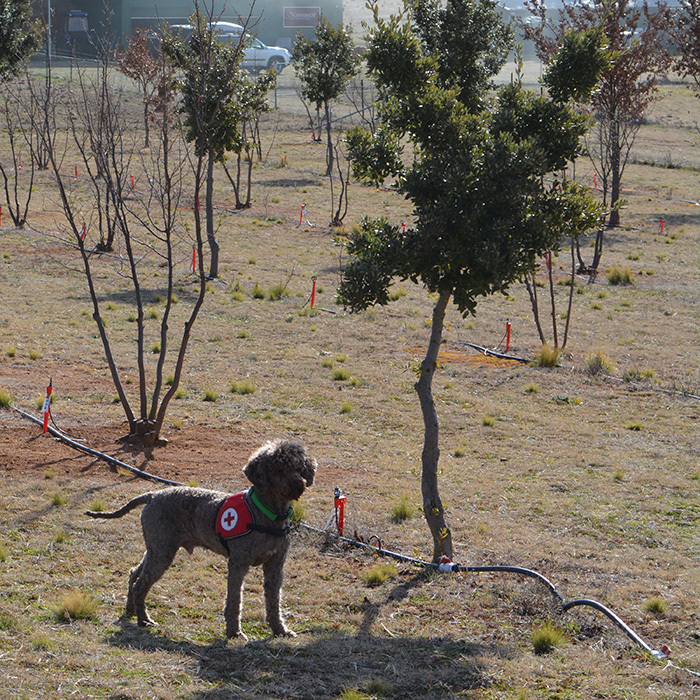 Currently, across the globe there are three methods of detecting truffles these are: pigs, dogs and flies. Macenmist chooses to use dogs. This highly appreciated delicacy is harvested during the winter months with the aid of specially trained dogs. Fahren and Tawdiffu the Lagotto Romagnolo are Macenmist’s truffle dogs. It is the Lagottos’ phenomenal scenting ability which makes it the only pure bred dog in the world that is recognised as a specialised truffle searcher. This unique task is what helped bring the breed back from near extinction. Fahren and Tawdiffu are worth their weight in black. Motivated by the promise of treats, they approach the regular truffle hunts with enthusiasm. From the moment a harness is attached they know they are on the job and starts to scent the airwaves, seeking the aroma of mature truffles. Macenmist has Black Winter Truffle (tuber melanosporum). Truffles are a type of fungi and have a system of root-like structures, but unlike most fungi truffles never emerge from the soil surface. 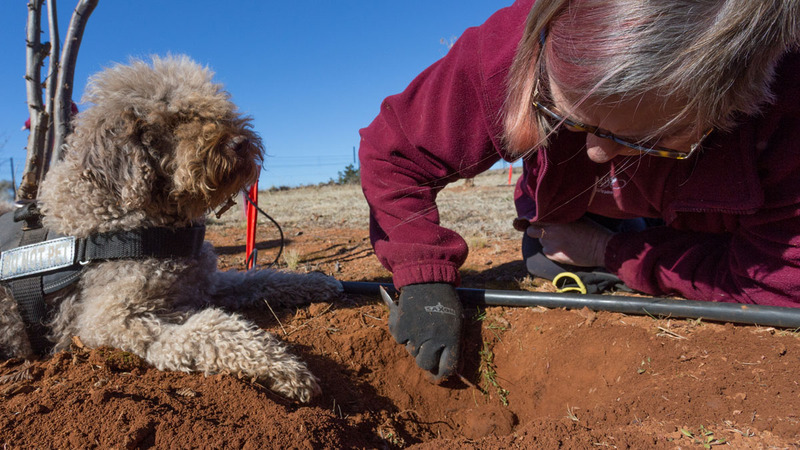 Instead truffles are formed underground close to a tree’s root system and are produced as a result of a symbiotic relationship with several tree types. The fungus that makes truffles can only survive in certain soil conditions and favours soils rich in calcium with a PH that is alkaline. These conditions provide an ideal environment in which the fungus can grow. Cultivated in Australia since 1991 these delicious morsels were initially harvested in 1999 and are now dispersed throughout the colder climate regions of the country. Harvested during the winter months this means that restaurateurs’ have the advantage of being able to access fresh black winter truffles year round as both hemispheres now produce the delicacy. This truffle is famous for attracting high prices. In 2007 a 1.5kg truffle reached record heights, being sold for $220 per gram with proceeds going to charity. This truffle is preserved by bottling or canning and can be purchased throughout the world. 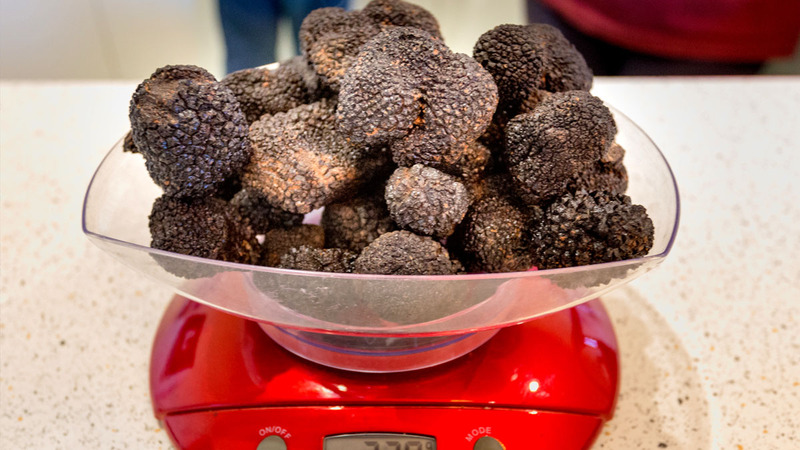 It is a cheaper cooking alternative to white or black truffles. Closely resembling the black truffle the brumale can be distinguished by rubbing the peridium (exterior) which peels away.